On Sunday, June 7 at 2 p.m. (a date and time that has been ingrained in my mind for the past two months), I taught my first public yoga class. Through weekends of yoga teacher training, multiple practice sessions and hours spent planning and preparing, this is the big moment I have been working toward since March. The entire week and weekend leading up to my class, I was extremely nervous. I woke up each day with butterflies in my stomach just thinking about what it might be like to finally teach my own class. I practice taught on Thursday and Saturday, still making small tweaks to my class along the way, removing an ab sequence here and adding a new pose there. On Sunday, the day of my class, I wasn’t quite sure what to do with myself until 2 p.m. I tried my best to sleep late (9 a.m. = my version of “late”), wrote a blog post, watched a few episodes of Parks and Recreation (perfect distraction) and finally around 1 p.m. left my house for the studio. I listened to my playlist in the car on the way over and mentally went through my class. Throughout the week, I was able to see the list of people signed up for class, so I knew that several close friends had signed up. It was encouraging to see a list filled with names of people I love and who support me. That made me feel good. Along the way, my class also filled up with names of people I didn’t recognize! (Our classes were open to the public and marketed as $5 donation classes since we are teacher trainees). It was exciting and nervewracking to see the names of people I didn’t know, too. Students began to file in and settle on their mats. It was such a powerful moment when I stood at the front of the room and introduced myself, as I’ve seen my teachers do so many times before. At 2 p.m. I opened class and began to set the theme for the day’s practice. One of my favorite things about yoga is when a teacher reads a quote or sets a theme that really makes me think and gives me something to focus on, so I knew it was important to me to incorporate that into my class. Want to know what my class’s theme was? Well…if you read my blog post on Friday (Welcome the present moment as if you had invited it) you already know! 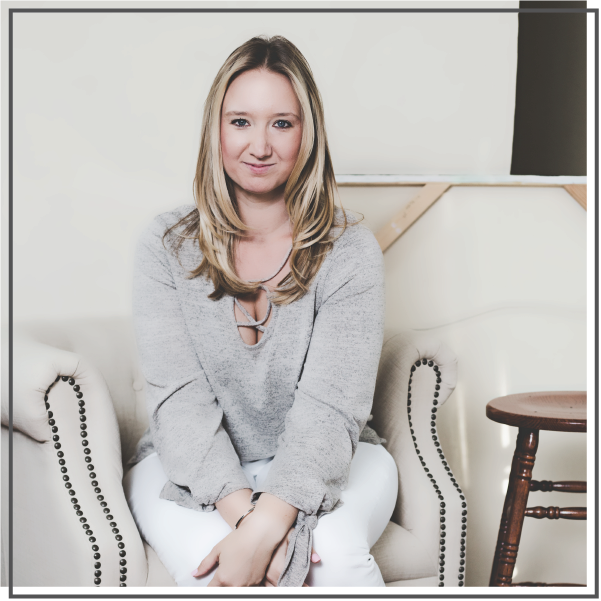 I didn’t mention it when I published the post, but to help me get in the right mindset and figure out exactly what I wanted to say to open class, I wrote it all down and decided to publish it as a post. The theme of my class was all about staying present in the moment and appreciating this moment for exactly what it is. I know this is a message I need to hear often, so I hope it resonated with my students that day, too. Once class started, I still felt nervous, but I also felt in the zone. I had prepared for this moment and at that time, there was nothing else to do except turn “on” and teach. I had my notes on the side of the room just in case I needed a quick check, but for the most part, I did my best to navigate the room while teaching. It was SO cool to see the class that I’ve practiced on so many people one-on-one or in a small group of 2-3 people come into action with a room full of yogis. Class was extremely HOT (hot yoga + 30 bodies in one room + an afternoon in June = very, very, hot) so I was sure to offer a couple breaks and opportunities for rest throughout class. I even got a few laughs at my silly jokes throughout class, so that felt really good. 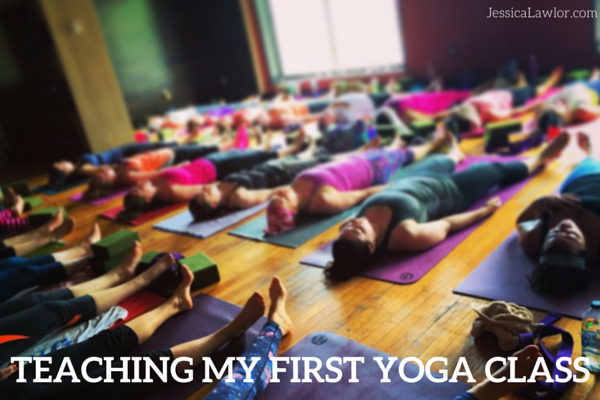 Once I put the class in Savasana, I sat quietly on the side of the room and tried to fully soak in and appreciate the moment. It was so beautiful to see so many yogis resting peacefully after listening to my guidance for the past 75 minutes. After teaching, I felt SO excited, proud and relieved. It’s kind of funny…my theme of class was all about being in the moment, yet I found it difficult to stay in the moment while teaching. Actually, while writing this post, I tried to think back to the middle of my class to recall specific moments, but I think I was so anxious that day that class kind of passed in a blur. Next time I teach, I hope to ease the nerves a little and be able to stay in the present. I received the best compliment ever from a student I have never met before after class. She came up to me and said, “I’ve been doing yoga for ten years and that was the best first class I’ve ever been to. I would have had no idea this was your first class.” That compliment truly meant the world to me. Teaching my first yoga class really affirmed that I think this is one of the things I am meant to do in life. I see the incredible power yoga can have on a person and I want to be part of that experience. I can’t wait to see where this journey takes me next. I’m open to it. I’m so incredibly grateful for my yoga family, from my teacher training friends and teachers to the teachers and fellow students I’m lucky enough to call my friends. I’m so thankful to be part of this community. There’s some debate over whether music is important for yoga, but to me, a great playlist can help motivate me and keep me in the moment during class. Creating my playlist was something I was really excited about and after it was complete, I spent the next few weeks tweaking it and moving songs around so that the music matched up with what was happening in class. Teacher training isn’t over yet! Teaching my first class was just one of the requirements needed to officially earn my certification. I have two more weekends of teacher training, a couple more papers to write and a 100 question exam to take at the end of June. From there, once everything is complete and I pass the test, I’ll be officially certified to teach! Thank you all so much for your support and encouragement leading up to my first yoga class! This was one of the most important ways I’ve chosen to get gutsy lately and it meant the world to know I had a community behind me rooting for me along the way!